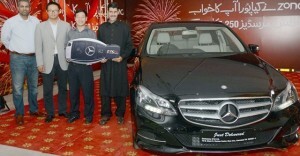 Zong Pakistan has announced lucky winner of Mercedes Benz car along with other winners of its recent promotion. Zong rewarded the customers who bought new SIM or port their numbers to Zong network in addition to consuming Rs. 200 to become eligible for the lucky draw.The bumper price was a luxurious Mercedes Benz.